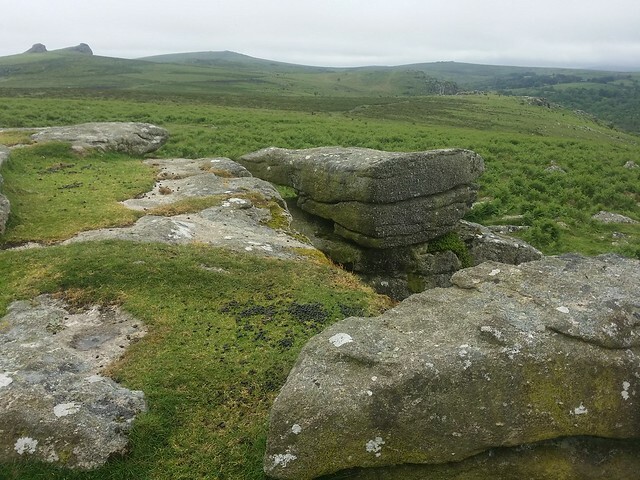 I was sat in the Fox Tor Cafe; outside the clag had closed in and the will to step onto the moor was dwindling. 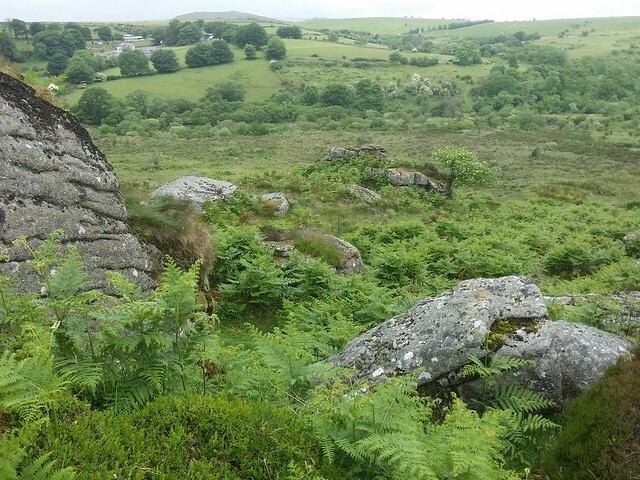 I reminded myself that although Princetown was in cloud, there was every possibility that there would be somewhere on the moor that would be faring better. Time to jump into the car and seek it out. Almost immediately, I left the murk behind as I left the town. 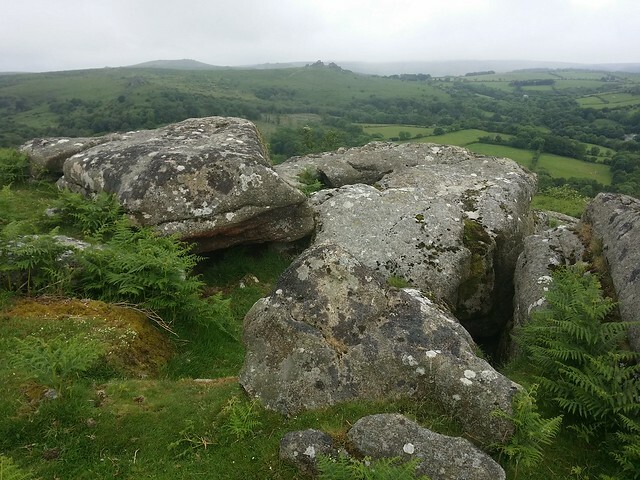 I drove over to Haytor Rocks, where I parked up with the intention of bagging thirteen tors, eight of which were new to me. 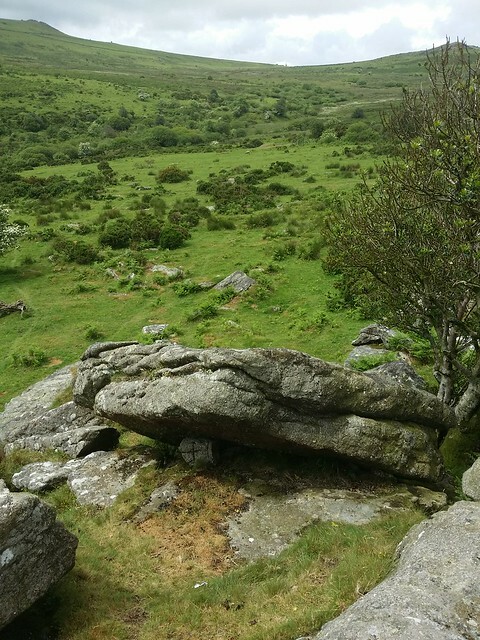 That's the beauty of this area, high above the village of Widecombe on the Moor; it is a tor bagging paradise with thirty three tors and rocks to visit, a feat I would like to do in a day, but was yet to attempt. My previous best was a none too shabby sixteen. The idea now was to mop up as many outstanding as I could this morning. I laboured up to the daddy of them all. 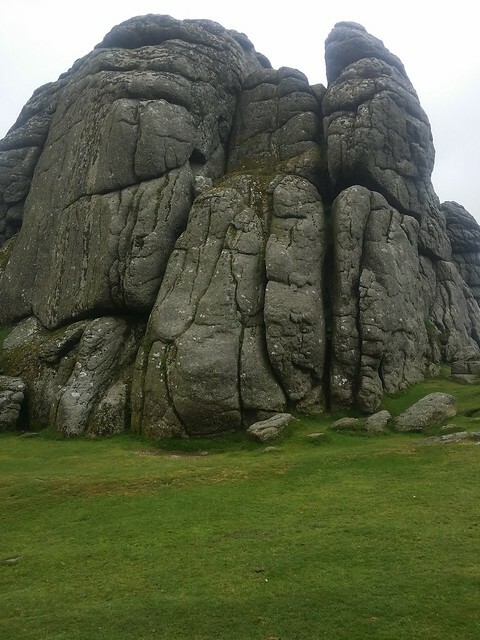 Haytor Rocks is often as far as tourists will venture from the car park below, their loss but my gain as this common would be crowded if they did. 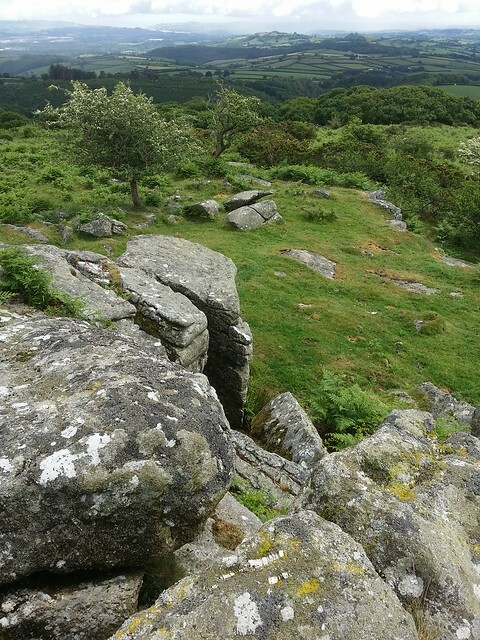 It is an inspiring example of a granite tor; its two major outcrops reaching for the sky, dominating the landscape and visible even as far as Cosdon Hill on the north moor. 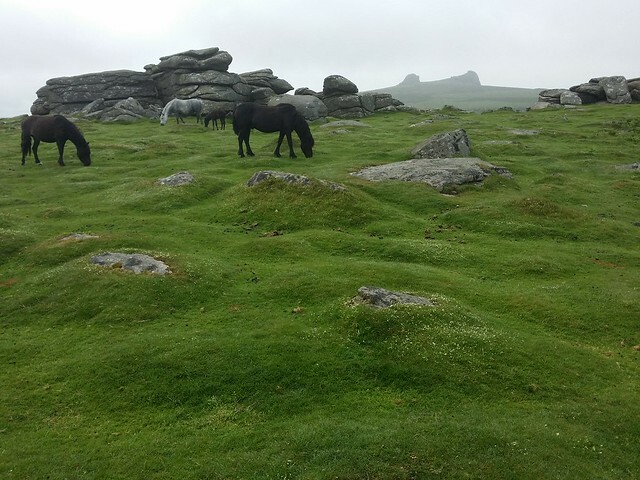 I did not linger, passing through the wide grass saddle between the two outcrops, heading north towards Black Hill. It's a typical stretch of animal tracks through low gorse and around the occasional area of bog but it is not difficult. 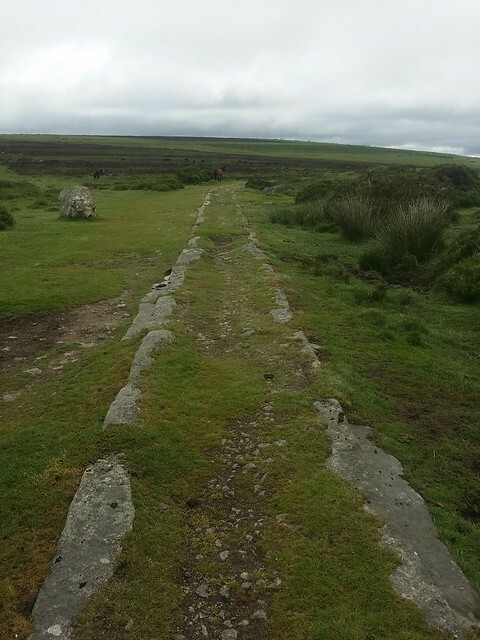 I crossed the disused granite tramway, which helped transport the same rock from Haytor Quarry to Teignmouth Docks, from 1820 to the 1850's. A short way eastwards from this section, there is the start of an eighteen mile walk along the route called The Templer Way, named after its creator, James Templer. 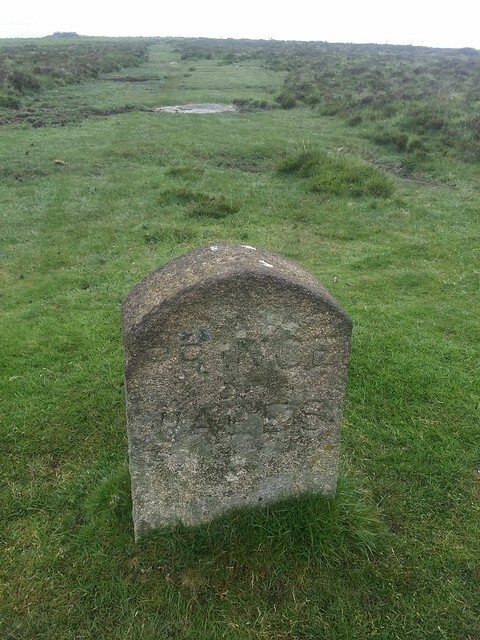 I was now ascending Black Hill on a wide, well trodden path, passing the Prince of Wales Boundary Stone. This, I find after a quick Google search, is one of two such named in the area; the original one erected by the Duke of Somerset, back in 1850. 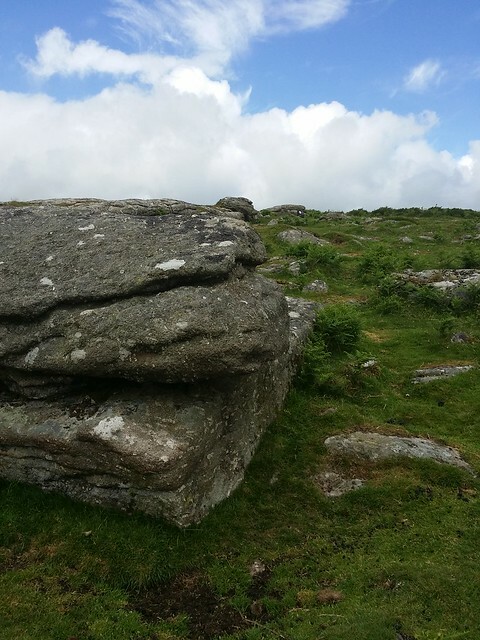 The newer stone was erected elsewhere on Haytor Down, by the Dartmoor National Park Authority, back in 2001, and causes a spot of confusion. 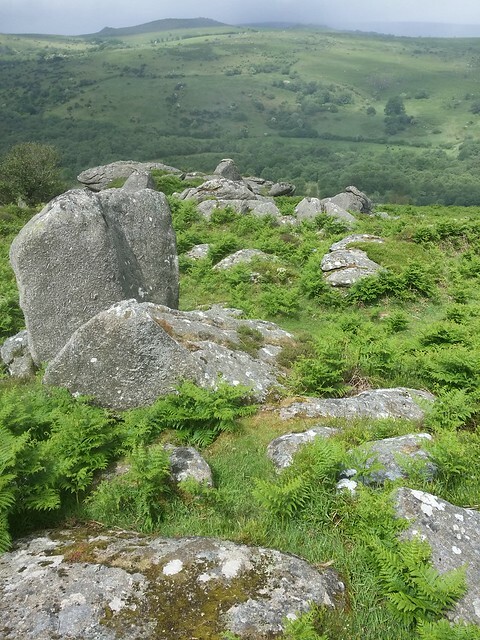 I was very pleased to see that Black Hill possessed a very good outcrop. Looking at the proximity to Hole Rock, below to the south-west, I can't fathom why I hadn't made the diversion to visit; shoddy commitment on my part. 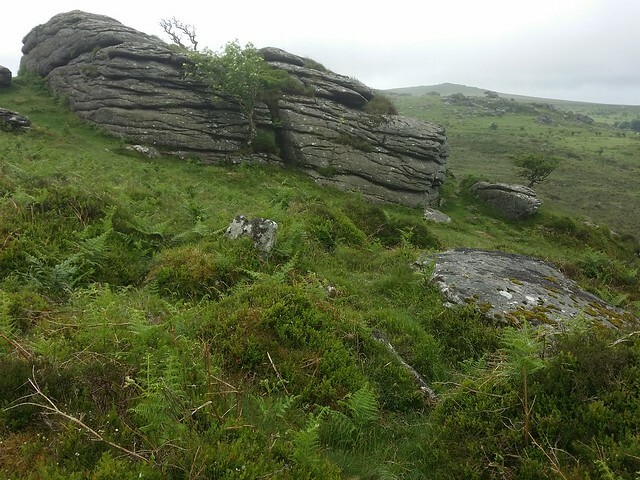 Lower Leighon Tor was obvious some sixty metres below, to the north-north-west. As I approached the outcrop I was delighted to find it continued further down the hill. 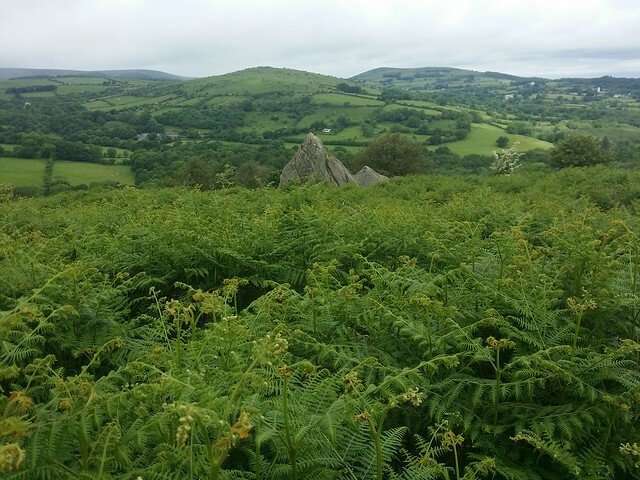 There was a pyramid resembling Cuckoo Rock I had to visit, by battling through the bracken. When I reached it, I could see there was more to discover, and down I went, where I came to the best example of Lower Leighon's collection. The lower outcrop is hidden from above, and I wager has little interaction with people. Like forgotten rocks within secluded forbidden woodland, this appealed to me and just reward for my efforts. 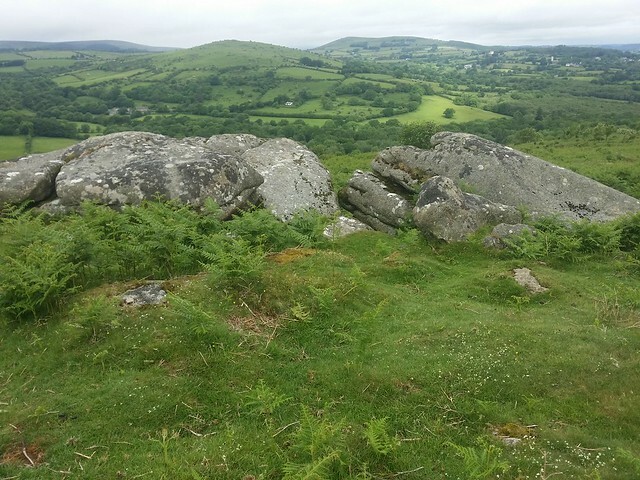 It also has a pretty special view west, across the Becka Brook, to Greator Rocks and Hound Tor (Manaton). I returned to the higher outcrop, a smile of satisfaction that I had explored a little further than necessary for the bag. 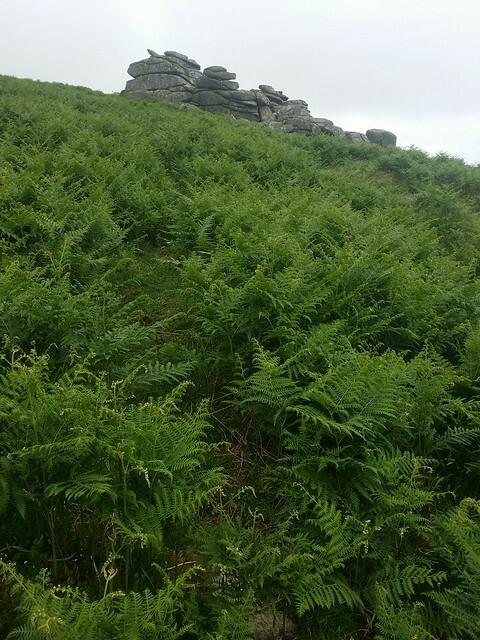 I found a contouring path that cut through the bracken before it was necessary to leave and ascend some thirty metres to Leighon Tor. This tor was much more obvious than the previous, its lofty perch on the side of Black Hill possessed all of the views of its sibling and is a fine specimen, but it lacked that feeling of exclusivity that Lower Leighon had afforded me. Onward I went, around the side of the hill. 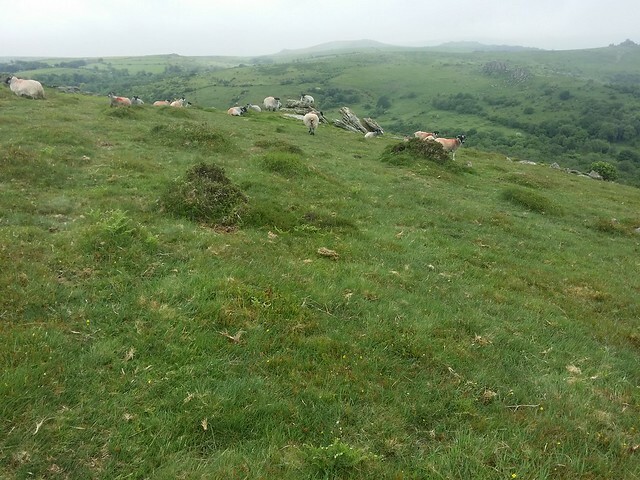 I passed Hole Rock surrounded by sheep and decided not to disturb them as I had visited quite a few times before. 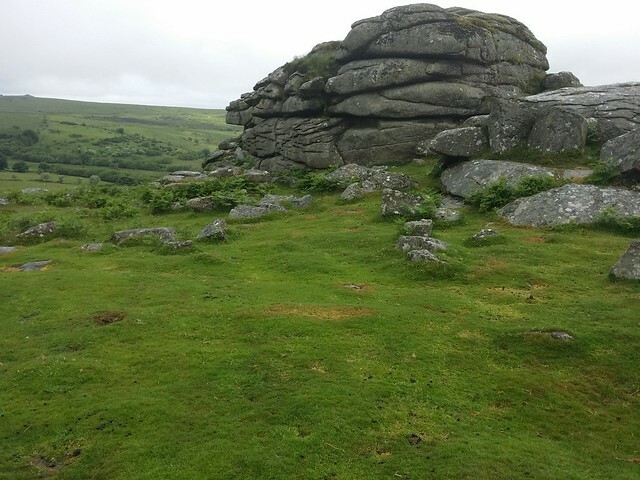 I reached Smallacombe Rocks, aka Grea Tor. I have been here three times before, passing through on a mission, but today was a shorter distance and I had time to explore it further. 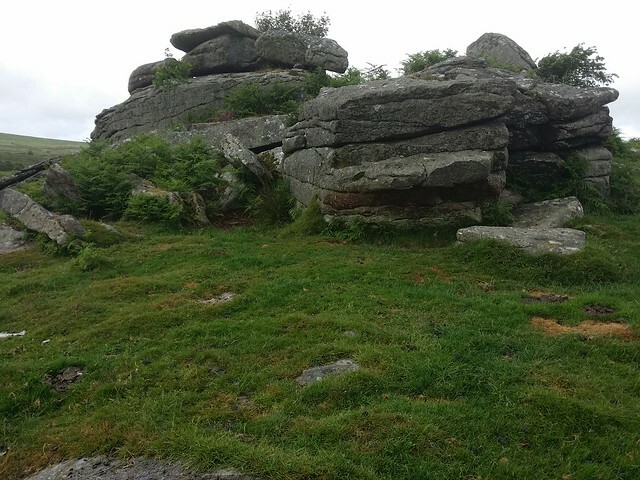 It is a large tor, spilling down the hill some way towards Beckator Brook. 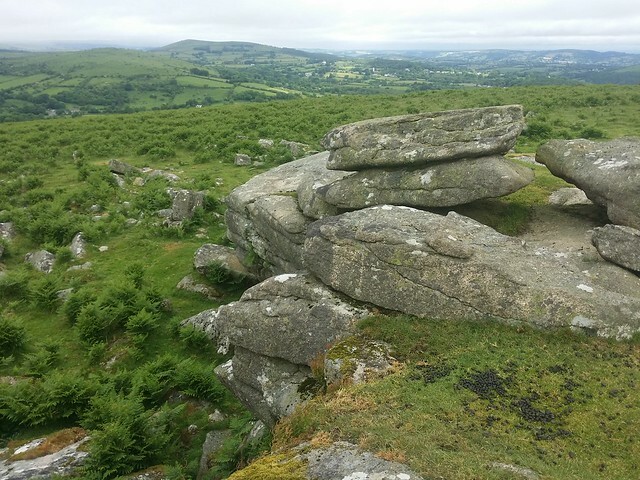 Its lower outcrops have decent views down into the valley and across to Greator Rocks and Hound Tor. Some fine rain swept in and it was time to don my jacket. I spotted a way through the bracken towards the granite tramway near Holwell Quarry. There was a small stream to cross first, which proved little problem, but going by the howls of laughter and screams from a group of teenage girls navigating their way down the hill, handrailing the water course, there was a mire below. It looked like they were having a thoroughly good time! 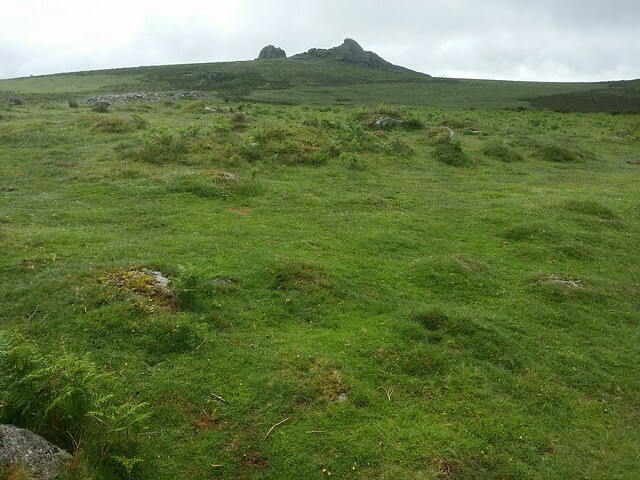 Reaching the tramway, I ascended the hill to Holwell Tor. 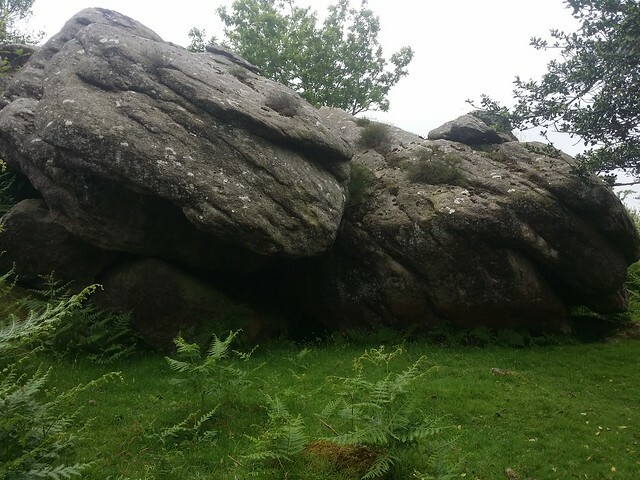 This is another substantial tor with a number of outcrops. I climbed the one overlooking the valley and could see my next two objectives below me. 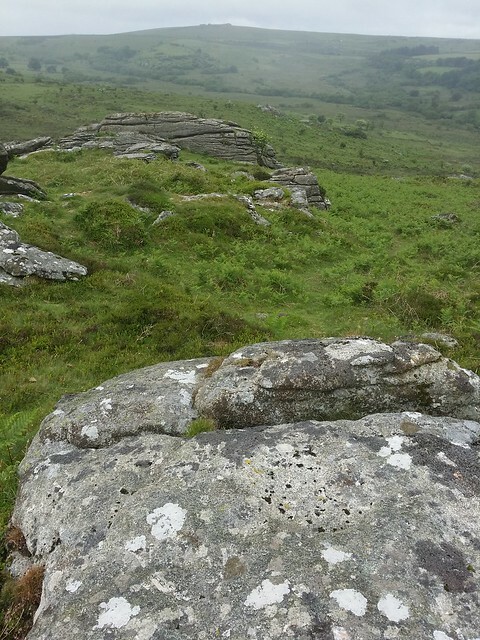 Continuing south, dropping down no more than fifteen metres in height, I came to the splendid Little Holwell Tor. 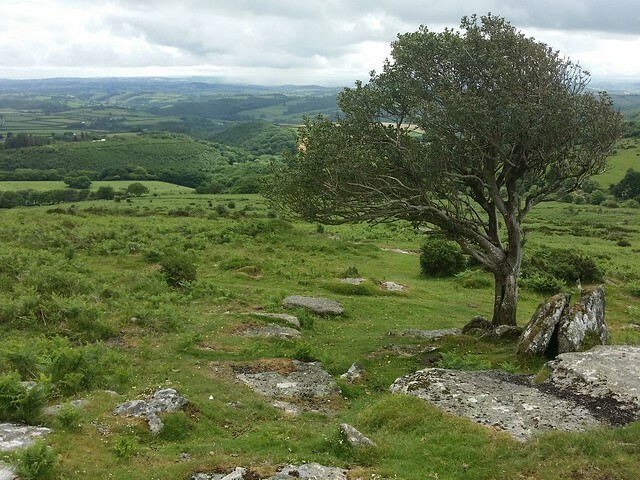 This consists of a few outcrops, the lowest being a split stack, but I was drawn to the largest, with a blooming rowan (mountain ash) tree protruding from its side. 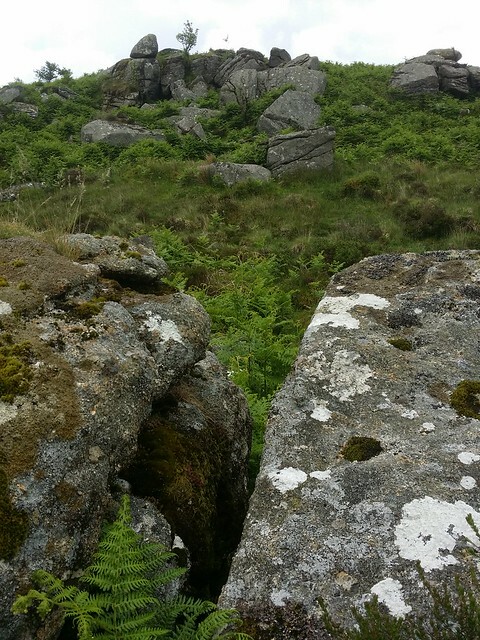 Little Emsworthy, my next stop, was surrounded by bracken hiding the uneven terrain and occasional bog. 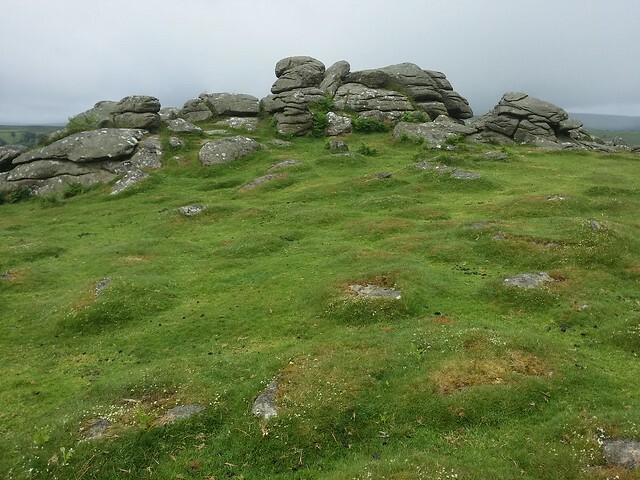 In his book, Ken remarks that it is insignificant compared with expanse of Emsworthy Rocks above, but its two main outcrops had something about them that were pleasing to the eye. 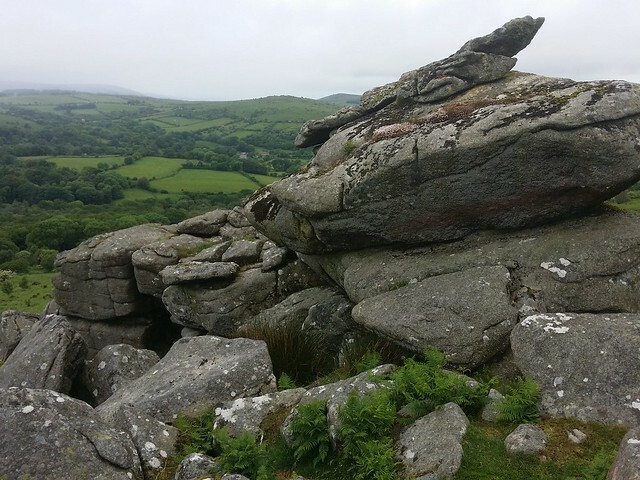 The rain was heavier now, and it impeded my judgement when negotiating the route around Emsworthy Rocks. I encountered a couple of dead ends before switching direction and opting to make my way up to the granite. Pleased I did because I reached a good path to Fitches Holt and then on towards the road. The good path veered right, running parallel to the road before a left turn made for the tarmac. It would have been a matter of a couple of minutes to take it, but I chose to ford through an area of burnt gorse, as the crow flies. The sun made an appearance and stayed with me across Bagtor Down to a gate with notice of a permissive path. 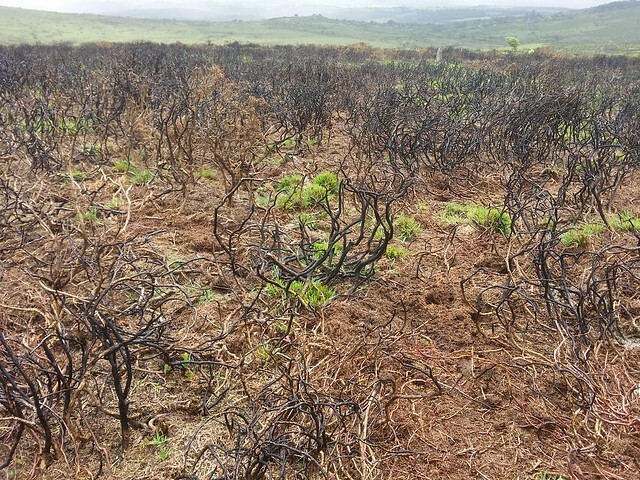 While the area is Open Access, the notice informs that between 1st March and 31st July, you must stick to the path to protect the rare ground nesting birds known to inhabit the down. I applaud the explanation, a reasonable restriction, and as the path leads to Bag Tor, I don't see any reason someone should ignore it. 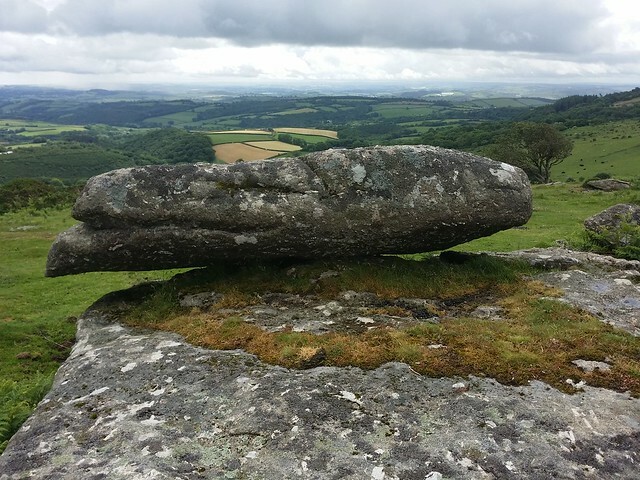 Bag Tor is a little gem, with excellent views to the south-east, of Newton Abbot, Kingsteington and the Teign estuary. I returned along the permissive path, to the gate. My last bag of the day entailed a contouring through the edge of some disused mining pits, and then ascent of Pinchaford Ball. All the while, taking plenty of chances to stop, turn and admire the magnificent views of the Devon countryside. I was intrigued by the name Pinchaford Ball; I saw, on the map, that there lies a farm called Pinchaford, below to the east, but the "Ball" aspect had me wondering. I later found out that it is a description for a hill with a rounded "ball" like appearance and not the name for the outcrop on it. 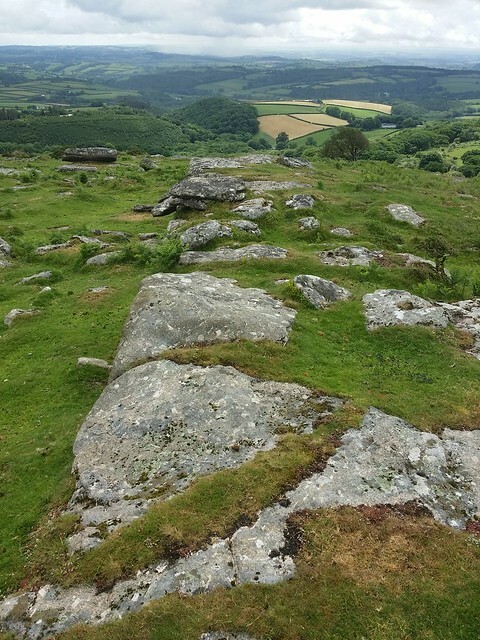 But for the purposes of bagging, the outcrops have been labelled the same as the hill; a long, straight line of low granite, with a logan stone perched at its eastern end. Whilst the final bag of the day doesn't dominate the scene, the vista more than compensates! I sat for a while to enjoy it. It was then a small matter of a short walk up over the hill's indistinguishable summit, down to the car.